Many hunters spend deer season in tree stands, especially those in the Midwest and Eastern US. It’s the most widely accepted method of hunting whitetails, and it provides a superior vantage point while removing the hunter from the deer’s immediate vision. 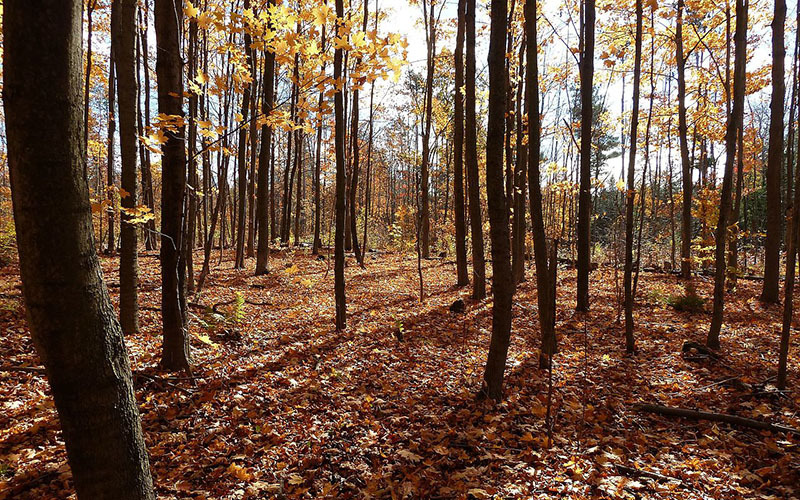 If hunters don’t use a tree stand, a ground blind is the other obvious option. Modern ground blinds are comfortable and easy to set up, and you can move them from hunting spot to hunting spot without too much trouble. 1800GunsAndAmmo writer Nancy Jo Adams has had a lot of success with them, evidenced in her review: Go BIG With Barronett – Pentagon Blind Review. There is a third option that many hunters swear is too risky: hunting from the ground without a blind. Many argue placing yourself on the same plane as the deer you’re after can lead to quick discovery and an unfilled tag. However, hunting from the ground isn’t as perilous as many hunters think. After all, those that hunt in the Western US often have no choice but to hunt from the ground, and you see plenty of great harvests come out of that region. So before you throw it out of your bag of tricks, let’s examine hunting from the ground in more depth. Before each season begins, hunters spend plenty of time scouting. They look for food and water sources, scrapes, bedding areas and any other signs of deer movement. The idea is to develop a plan as to where they can sit and catch a deer moving to or away from the areas they frequent. If you hunt in a tree stand or ground blind, you’re limited to only a few select spots deemed to be suitable enough for setup. You either need a big tree or a reasonably flat spot to hunt from, and usually hunters can only find 2-3 of these spots per season, max. However if the wind isn’t right or a spot is just dormant, these hunters can be left with no good spots for the day. Hunting from the ground on the other hand opens a world of possibilities. There’s no setup to worry about, and you’re free to go wherever the conditions best suit your hunt. Scouting becomes much more fruitful as well since you can pick out multiple spots as part of your hunting plan. You don’t have to spend time setting up a blind and risk spooking deer in the process. Just head silently to your spot and start hunting immediately. While there are a lot of advantages to hunting on the ground, you need to pay extra attention to your concealment to be successful. A quality camo setup is key, and you’ll absolutely want a brand and pattern that breaks up your outline. Opt for concealment camo from brands like Sitka, Predator Camo and Kryptek if it is in your budget. This is not to say that mimicry camo won’t get the job done, but you’ll improve your chances if you can break up your silhouette. Remember, in some cases the deer might be right up close as you ready your shot. Some hunters prefer leafy or ghillie suits which work great as long as you’re mobile enough to use your firearm or bow in them. Finally don’t forget to adhere to your state’s blaze orange requirements. 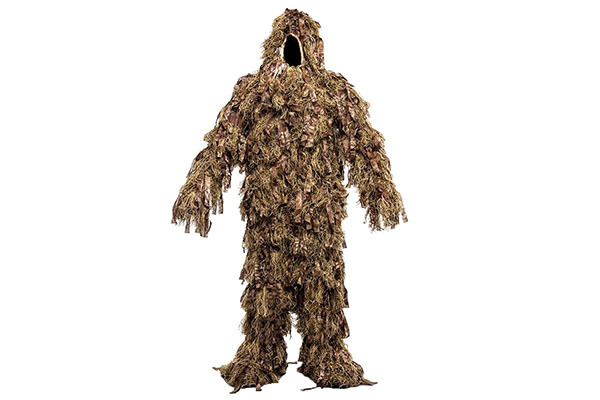 The ultimate ghillie suit option comes in this Kryptek Highlander Ghillie Suit Set ($149.99). Good camo is just part of the equation. You need to be especially silent and motionless when you hunt from the ground. Often a quick glance from a deer can give away your position, and you need to hunt as if the deer is right in front of you all the time. This is not to say that you shouldn’t hunt this way in a stand or blind, but when you’re down on the ground, your margin for error is especially slim. Scan slowly and have your firearm or bow in a semi-ready state all the time. 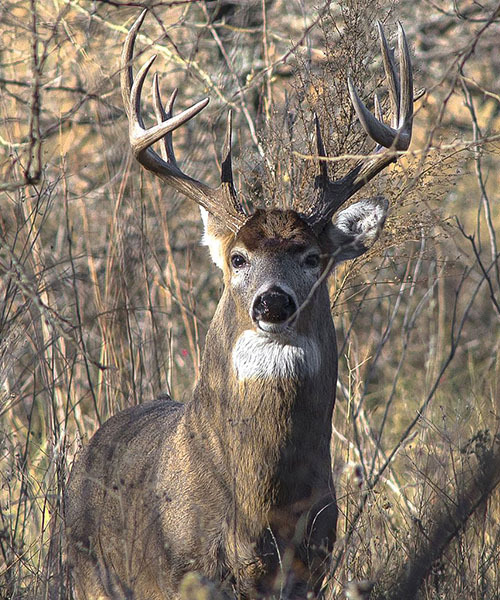 When the buck you’re after does show up, be extremely careful as you ready your firearm or bow. Only move when the deer’s head is down foraging. If the deer’s head is up and scanning, they may catch even the slightest movement as you ready to shoot. Patience is key and you’ll have to be tactile as you search for the best shooting lane at the deer. You’ll never quickdraw a deer, so don’t try to pull up on them quickly. Instead bide your time, slowly get ready for the shot and wait for the perfect time. The best place to hunt on the ground is up against a large tree. This will help break up your silhouette. A small tree or clump of bushes may only break up part of your silhouette, so opt for something as big as you. Plus you can use the tree as a backrest while waiting for a deer. Sit on the ground or bring a camo cushion to help keep your body off the cold ground. You’re really taking chances if you sit in a chair or on a bucket as the deer is more likely to pick you out. If you’re too old or sore to sit on the ground, then realistically it’s probably time to opt for the ground blind instead. Remove any stray limbs and leaves that may give away your position as you sit, but don’t get too zealous about clearing the location. Small saplings, bushes and other cover that is around will help conceal you from the deer. Don’t sit too close to the throughway or deer trail you’ve selected to hunt by as you don’t want the deer walking in right on top of you. A good 20-30 yards is a better bet to give you some distance to prepare your shot. Make sure the location you select has enough shooting lanes to give you a good chance at the deer. If the trail or ambush point is nearly covered up by brush, then select another location with a clear shot. Of course pay attention to the wind direction as you select the location. You don’t want the deer picking up your scent before you have a chance at a shot. Hunting from the ground is not for everyone, but it can be an important asset in any hunter’s approach. Even if your primary plan is to hunt from a stand, you can still use this approach on days where the stand location isn’t ideal. Feel free to share your ground hunting success stories below, and good luck this season. Image one and thumb and three courtesy of Wikimedia Commons. Expectations Can Lead To Disaster!